This sixteenth century cathedral that is lit up at dusk is the Jean Cathedral Church Building located in the Province of Jaen in Andalusia, Spain. The bright white lights make this building stand out against the darkened streets around. This sixteenth century building that is so lit up with bright lights as the rest of the city settles in to the light of dusk is the Jaen Cathedral Church Building, located in the Province of Jaen in Andalusia, Spain. The cathedral is located in Santa Maria Square and is a focal point of the whole city. The Cathedral of Jaen is trying to get a spot on the UNESCO World Heritage Sites list so that it can be cared for and repairs can be made under the World Heritage Program and that way the cathedral can be still standing in all its glory for many more hundreds of years. 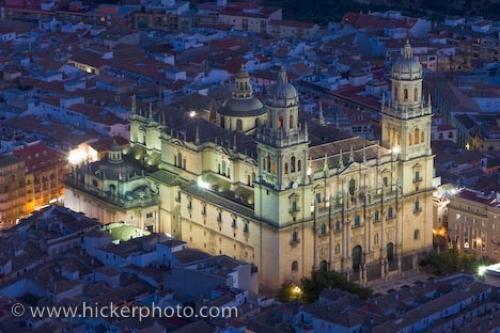 Photo of the sixteenth century Cathedral Church of Jaen at dusk in the City of Jaen, Andalusia, Spain. ... Due to damage the cathedral kept having to be rebuilt over the next couple of hundred years, until the sixteenth century brought a few architects together to build the largest part, most of which still makes up the cathedral today. As it has such an extensive past and is such a focal point in the city of Jaen, this is a popular site and thousands of tourists come here every year to stand in a building that sits on ancient ruins, parts of which date back hundreds of years. Cathedral of Jaen at dusk in the City of Jaen, Province of Jaen, Andalusia (Andalucia), Spain, Europe. I photographed this photo with the digital SLR camera model Canon EOS-1Ds Mark III, aperture of f/9.0, exposure time of 25/10 sec. on ISO 50, as always I used a original Canon Lens, the focus lenght for this picture was 153mm.